It doesn’t take much to convince us to apply a drizzle of rose, neroli or geranium oil onto our skin. Essential oils from fruits and flowers are so intoxicatingly delicious-smelling that we can barely keep from drinking the stuff, let alone slathering it on our skin. 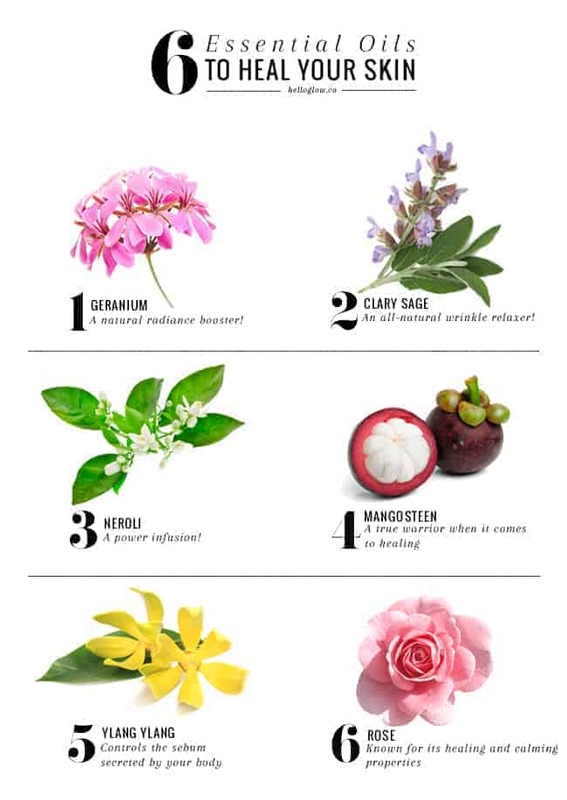 Luckily, Mother Nature designed these oils to attract with good reason: natural essential oils have incredible healing and soothing properties that, when properly utilized, can transform skin. We asked The Chalkboard Magazine to break down the best uses for a few of these oils for certain skin types and conditions. Find the oil that suits your skin and find a way to work the scented stuff into your skincare regimen! Essential oils melt into the skin, versus conventional lotions and creams, which can sit on the surface. The molecules in essential oils are much smaller than that of most skin creams, meaning they’re able to penetrate each pore more deeply. The deeper oils sink, the more they work. As counterintuitive as it may seem to use oils on the skin, especially when skin is troubled or in need of healing, they are actually deeply effective from the inside out to heal and nurture the skin. Here are a few of the oils we love most to treat skin conditions of all kinds. A natural radiance booster! This is an incredible essential oil for dull, dehydrated, fatigued skin. With all of the traveling I do, I use it as a way to ignite my tired, airplane skin. The scent is so unique, it’s unforgettable. An all-natural wrinkle relaxer! It is an amazing pore decongestant, anti-inflammatory, antiseptic, and stimulator of blood flow. Using it topically helps with eczema, psoriasis, and even back and neck stiffness. Also known as orange blossom, neroli is regenerative. It overturns your skin’s cells at a faster rate, promoting radiance and vitality, as well as preventing scarring and combating stretch marks. A power infusion! One of my all-time favorite oils. This oil is less known, but a true miracle worker. Not only does it calm the signs of inflammation, but it also helps with stimulating collagen production and regenerating old cells and making them act brand new. A true warrior when it comes to healing and looking your most youthful. One of the most exotic smelling scents! Whether you’re super dry or super oily, ylang ylang balances your skin remarkably. It controls the amount of sebum secreted, leaving you perfectly hydrated all day. Rose essential oil is known for its healing and calming properties. Its benefits are incredible for those who suffer from eczema, very dry skin, and aging skin. It combats the most stubborn skin ailments, and it has super-relaxing aromatherapy properties. Calm mind, calm skin! For more skin-healing essential oils, visit The Chalkboard Magazine. I am so glad that I found this helpful post. It’s great to learn more about essential oils. Essential oils are a part of my daily life! Different essential oils have different effects. what do you do with them? I have heard direct application can be overwhelming to the skin. I’d love to know how to work with them specifically. The rose hip Oil is amaaazing as well, it rehydrates and brightens areas with to much pigment. I blogger about an organic rose hip Oil after I’ve used it for a year. Ah love this post? Which one would you recommend for sensitive acne-prone skin? I’d really like to clear my skin up!